A new paper shows a convincing causal link between local air pollution and the incidence of dementia. Those of us old enough to remember credible analysis underlying serious attempts at federal climate”ish” policy will recall that a huge chunk of the benefits from lower greenhouse gas emissions from power plants were so called co-benefits. Not benefits from less climate change, but direct positive health effects on Americans from being exposed to fewer local pollutants such as SOx, NOx, PM10 and PM2.5, most of which come from energy use (e.g., cars, trucks, factories and power plants). Cleaner air kills fewer people and makes fewer people miss days of work because their lungs are inflamed and their hearts are suffering. How do we quantify the link between pollution and health outcomes? In the old days we would put subjects in a room, expose them to the pollutant for a few hours (in some cases while they were smoking and watching TV – I am not kidding) and ask them how they felt as well as take their pulse and stuff. Early statistical work compared health outcomes across cities with different levels of air quality, which can be problematic in many ways. A recent literature, that has Berkeley written all over it, Greenstone (former Berkeley Post-doc) and Chay (former faculty); Walker (faculty) and Schlenker (Berkeley Ph.D); Graff Zivin (Berkeley Ph.D.) and Neidell (OK, UCLA Ph.D); and Shapiro (faculty), has used fancy statistical techniques to tease out a causal link between air pollution and a variety of economic outcomes. And the news is not good. 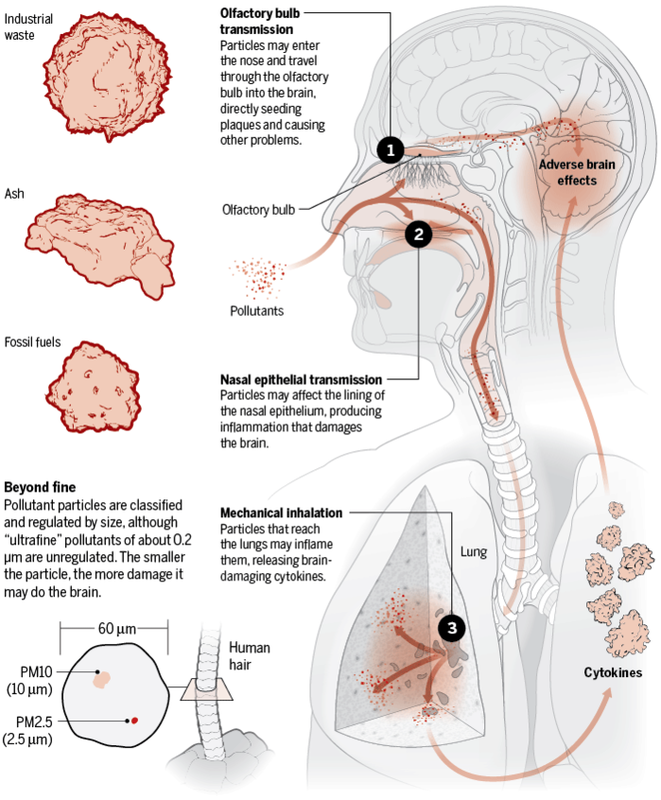 Air pollution is very, very bad from a mortality, morbidity, cognition and productivity angle. A recent paper by the brilliant team of Kelly Bishop, Jonathan Ketcham and Nicolai Kuminoff at Arizona State University caught my attention and should catch yours. They tracked the Medicare records of 6.9 million adults 65 years old or older and linked them to the air pollution exposure of these individuals from EPA monitors. The beauty of this big data exercise is that you know where people live, their health and diagnoses. In order to establish a causal link between air pollution and dementia, they use a change in air quality induced by regulation, which solves the statistical issue that air quality is correlated with things like business cycles that may affect whether people go to a doctor’s office and get diagnosed. In short, I buy the statistical approach and I, like many of my colleagues, am a total snob when it comes to stats. So in a regression framework, they show that a 1 microgram (roughly a 9% increase relative to average concentrations) per cubic meter increase in decadal exposure to PM2.5 increases the probability that you are diagnosed with dementia by 1.3 percentage points. This is a big number. Dementia is the fifth leading cause of death worldwide. It massively lowers peoples’ quality of life and leads to significant increases in medical spending. The paper states that a lower bound on the cost of care for dementia patients for the US is $277 billion dollars – some of which we can now conclude is due to air pollution. In addition to medical expenditures, the paper gets at an angle hugely relevant to social scientists. When we teach economics to our undergraduates, we always assume a fully rational decision maker who maximizes their well being by making optimal decisions for themselves – on average. Dementia prevents us from making these optimal decisions. In their setting the authors can test this. Medicare Part D enrollees have the choice between roughly 50 prescription drug insurance plans, which vary among a number of dimensions – most notably the prices of prescription drugs. The plans that enrollees choose become their automatic default plans in the following year, but enrollees can change annually. Hence depending on what condition one suffers from, one can reoptimize by picking a plan which sells the portfolio of drugs needed at a better price point. The paper calculates an indicator of potential savings by computing the cost-minimizing plan for each patient, a measure of inertia (whether patients just stick with the same plan for a long time), and a measure of suboptimal choice (whether patients choose plans that are more expensive and riskier than other plans sold by the same insurers). They show that patients diagnosed with dementia forego $37 a year in savings compared to statistically identical patients without dementia. They also show that probability of inertia and the probability of picking a suboptimal plan goes up. So why should we care? Producing energy, or anything that emits local pollutants, imposes large costs on society that producers are mostly not paying for. Sometimes we know these social costs and we fail to act for political reasons. In other cases we discover mechanisms that impose costs on society which we did not know existed before. This is such an example and the human costs are big. This effect should be incorporated into benefit cost analyses of energy policy. Our role as academics is to continue to provide research of the highest quality uncovering and quantifying these effects for pollutants of all types. Next Next post: Are Solar Microgrids the Future in the Developing World? Your last sentence is: “Our role as academics is to continue to provide research of the highest quality uncovering and quantifying these effects for pollutants of all types.” The academic’s dilemma is deciding which effects to work on. Incentives favor effects that support the politically correct narrative of the day. Who is going to work on the politically inconvenient effects?